"Hero-version" bladed glove, with steel blades. "Hero-version" bladed glove, with aluminium blades. "Safety-enhanced" bladed glove, with aluminium vacuum-plated, soft-plastic blades. "Stunt-version" bladed glove, with painted rubber blades. "Impaled-blade-version" bladed glove, with blades cut down to various lengths. "Hero-version" machete, with steel blades. "Fly-by-wire-version" machete, rigged to travel along monofilament. "Stunt-version" machete, with rubber blade (supported by an integrated still plastic mandrill). "Flaming-version" machete, with steel blades that featured cut-out sections. These sections were filled with a fireproof and porous material that could absorb flammable liquid. "Impaled-blade-version" machete, with blades cut down to various lengths. Jason's machette was relatively low maintenance. I did however require a clamping device be mounted to my "set-cart" to hold the machete, while I carefully drizzled stage-blood onto the blade. I was constantly redressing blood on that machete! Freddy's glove was another matter. Because there were so many versions available, I was often substituting one type for another within a given scene, as constantly changing conditions demanded. This also required that I carefully match the "blood-drizzles" on the blades established for that particular scene, for each version used. 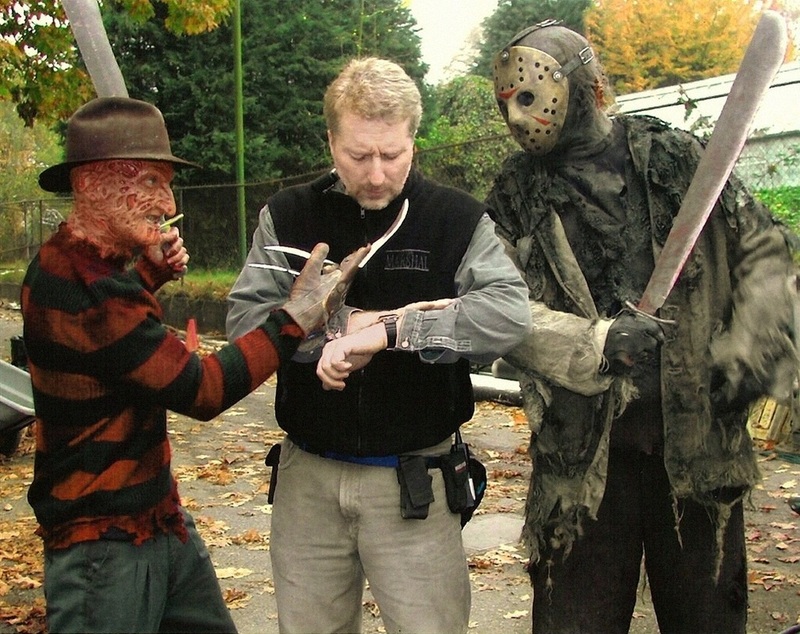 For some reason, Jason's machetes weren't changed-out as often. More challenging however, was the constant breakage the finger-blades incurred. I had an assortment of replacements I could changeout as needed that comprised of a copper finger-tip section, with finger blade attached. I also had riveting kit, which was used to replace any I'd have to drill-out, as a function of replacing the copper finger tips. These repairs were conducted from my set-cart, sometimes just in time, before the camera would roll! Occasionally challenging, but great fun to do… given the easy-going and professional cast and crew.